There are as many faces as there are emotions, each powerful for what it conveys. Yet we wear them as though for the first time, unaware of their power to affect those we love. If our smiles are the heat of summer and tears the rain of spring. If our naked bodies wrapped in blankets are autumn preparing for winter, then we can embrace each season as an integral part of the cycle, and look forward to what each brings. When we live in fear, we see only failure. When we fail, we protect ourselves. When we are protected, we feel afraid. As with so many of us who feel a kind of deep pain when injustice is served, I have struggled to make sense of what unfolded this past two months. What I witnessed often felt too far removed from my own experience to present anything more than a repeat of what had been said by experts in history, psychology, and politics. In a world where the generational demographics are changing, where the borders are no longer clear, there resides a growing sense of “What about me?” When a leader focused entirely on himself says “Make American great again” he implies “I want to be in control” where we seldom feel empowered to do anything. It became implicitly clear on election night that I live in a bubble, surrounded by those born with the empathy gene switched on. A blessing or a curse, it is difficult to determine at times. My friends, colleagues, and peers all in disbelief at such an overt expression of anger, bigotry, and fear. Not since Woodrow Wilson and the segregation of the White House staff have we seen this rise to the office of the president. Should we be surprised? Dare we expect a consciousness rising to have established a new equilibrium since 1969? We remain a product of our DNA and evolution does not work with such haste. We are not yet arrived to a social paradigm in which those born without the expression of xenophobia carry the upper-hand. Until that day, we must live with the potential of radical, even bipolar change. 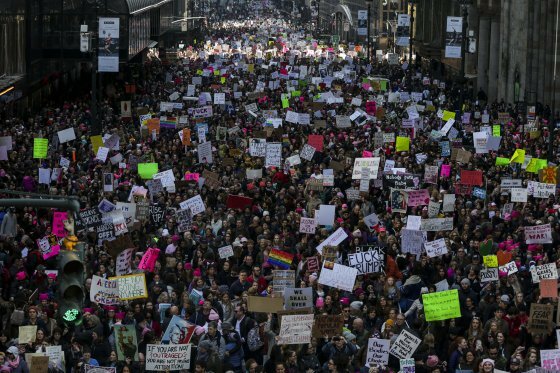 But when more than one million people stand in peaceful protest against one man, calling for equal rights for all humankind, that is a kind of stirring the pot that might just make this president worth his crimes. Express creativity in multiple forms. Promote science education as the best hope for the next generation. Never stop learning or challenging the norms. The Internet has failed to deliver what was promised over two decades ago. Or perhaps, we have failed to fully embrace that which it delivers. We have at our finger tips facts, figures, and data. At any given moment, 24 hours a day we can validate and substantiate the tidbits of information which bombard us. We can negate rumours, stories, and marketing campaigns that tease our sense of logic or appeal to our emotional pleasures and fears. The Internet also delivers a kind of drug, an addictive substance which calls upon the very foundation of our DNA. We are drawn into conspiracies, twisted logics, and backward ways of thinking that support our innermost fears, the stuff that predates one or two generations as we give into eons of xenophobic behaviour. While the spiritually minded speak hopeful of consciousness rising, I see instead the rise of the human species for who we are when the spiritually minded retreat to their havens of like-minded and similarly kind. Perhaps some day the Internet will deliver an upgrade to humanity, a version 2.0 in which we care about the other as much as we do our own self. But for now, the beta release a few million years in the making will have to do. Something thin, transparent, yet powerful and strong. in the same moment, allow what is desired to enter. It is neither supernatural nor entirely physical, … or perhaps it is both. I have something for you, a gift that cannot be given, a source of tremendous power that is always within reach yet difficult to receive. Every time we accept a rule or a guideline without asking Why?, we give into someone else’s power. Every time one group of people is told they don’t belong because of their beliefs, we have used religion as a means of controlling how people think and behave, isolating rather than uniting. A belief is a powerful motivator, a means to drive one forward through challenging times, to unite individuals in a common goal, for multiple generations. Yet, a belief is nothing more than a thought process, nothing more than an electrochemical pattern in one’s head. It cannot be proven nor denied, therefore it should never, ever be used to conquer and divide. she will find comfort in what was left behind.